Close is a CRM platform popular among salespeople which provides a sales workflow, ultimately used to close deals. Close gives you an overview of activities relating to your sales, bringing items to your attention according to their level of priority. It has a simple UI with a beautiful timeline view where every member of the sales team has complete access to every detail of the sales process. Close has features like built-in calling and SMS to let you reach your contacts quicker, an e-mail tool that lets you send e-mail sequences to specified contacts quicker and a powerful search engine that provides you with results at amazing speed. Additionally, Close provides an actionable report system, helping you measure team performance. 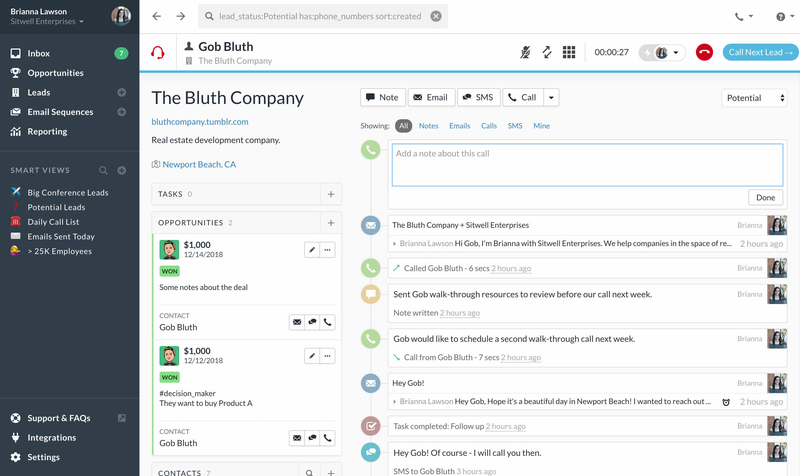 Call automation, predictive dialing, bulk email and email sequences – Close handles them all. Close is can be integrated to other tools like Zapier, Zendesk to ensure users get the most out of its features. How much does Close cost ? The pricing for Close starts at $55.25 per user per month. Close has 3 different plans such as - Basic at $55.25 per user per month, Professional at $80.75 per user per month and Business at $123.75 per user per month. A modern CRM solution with built-in email sync, global calling, and SMS. The software imports all of your data into Close and removes the duplicates. Automate your outreach with email sequences and the Power Dialer. 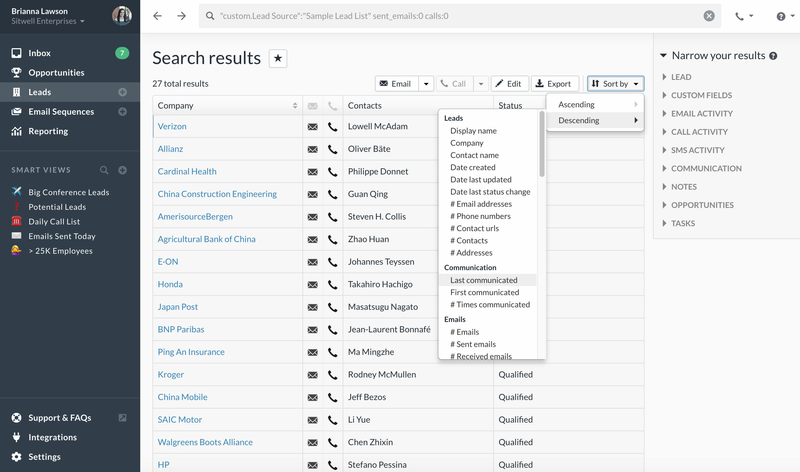 Reach more leads than ever before with the built-in Predictive Dialer. 10 plus Seats or More, contact the vendor to get the detailed pricing information. Disclaimer: The pricing details were last updated on 05/10/2018 from the vendor website and may be different from actual. Please confirm with the vendor website before purchasing. Overall: On a larger scale, Close becomes really impractical. Sales agents lose track of contacts, there's no meaningful data analysis that can be done because of a lack of tagging and order. It's a good package to start out with, but I find that companies move along quickly for more powerful and useful products. Pros: So uncomplicated and straightforward to use. CRMs can be a real pain, and this one is a joy. Cons: Although it's packed with value, it's still pricey compared to competitors. However, if you can do it, I still recommend it. Overall: Used it daily as a sales rep and it made managing everyone and seeing all communication simple and allowed me to spend less time tinkering and more time closing sales. It does a great job of getting out of the way so you can focus on what's important. Pros: I can search my database by notes I've made, or specific actions like calls on a certain date. And, then set up a workflow & follow-up sequence accordingly. Cons: Setting up a personalized workflow & follow-up sequence takes a long time, but once it's done, it saves lots of time. The email marketing feature needs improvement. Overall: Close is very cool because setting up a personalized workflow & follow-up sequence got me focused on what I need to do next without wasting mental energy on figuring it all out anew every week. Cons: This is not a CRM period! I would only recommend this if you were integrating it with a dedicated CRM system. The notes are chaotic and very difficult to look back through history and find important past conversations. There is no ability to do ANY form of contract management once a customer is closed and there is also no ability to attach anything to the opportunity info. So if you have a relevant presentation or any documentation relevant to a potential sale you best save it in a google drive and make a custom field to stick the link in. Overall: In the end it's very expensive for a bulk lead calling tool. 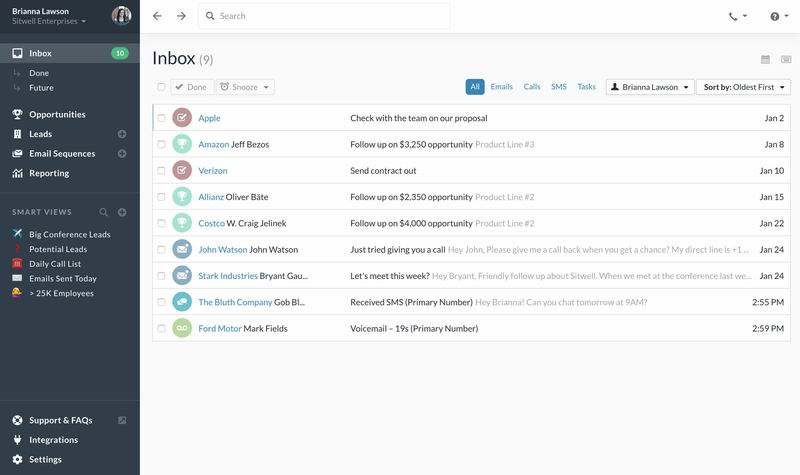 Close.io is a really powerful sales CRM and we like how it also integrates files, phone calling, and have the whole email history easily reviewable. The pricing per user is pretty high, but I guess this is pretty industry standard for sales/CRMs. Wish it was a bit more affordable. Pros: The easy to use dashboard to navigate through the tools is fairly easy to use. The thing I like the most about the software is how easy it is to spot, an email, a phone call, and even the ability to do call listening sessions. Cons: There just has to be a much better way to view information, it seems so cluttered. Yeah they have breaks and labels to separate data, but it is very eye tiring. Pros: Close.io is every sales teams dream! Its super simple but extremely powerful! It has everything you need to effectively close deals daily and keeps you on track with very little effort. Cons: I wish there was a two record type Leads and Accounts. There is a work around but my personal preference is a clear distinction between leads and accounts. Pros: This software was a colossal waste!! DO NOT waste your time or money!! I used this software for less than a week before they were snooping around dictating my business practices and interrupting my business transactions. I am absolutely disgusted by this service. I tried to get get a hold of the sales rep 5 (FIVE) times and each and every time it goes to voicemail. They don't work weekends and wont answer you on weekends, so don't bother. They will email you a week later and if there are technical difficulties, they absolutely will not talk to you in a timely manner, they will just shut your acount down. THEN they tried to extort me for my credit card in reward for their terrible sales and joke in the form of what they call "tech support/customer service". Ridiculous! I lost so much money dealing with them! It was a horrific experience! Cons: The joke they call "customer service/tech support". It's an extortion scheme! Overall: Horrific. I am here to warn others. Do NOT get yourself wrapped up with them. It is a horrific experience! They are there for one purpose and one purpose alone: to extort you, in any way they can find, for your credit card. They don't even hide it. Pros: My favorite thing about Close.io is the ability to add custom fields that help with reporting and overall ease of use. Also being able to call directly from the software and have the calls recorded and task creations are very simple. Cons: The user interface could use some improvement. The flow of things can sometimes get a little chaotic so creates extra time to learn the system. Overall: Close.io is great for tracking leads and customer bases and the communication timeline as well. Pros: Close is an easy way to keep track of leads and customers alike. We can set tasks, see who is calling, and have visibility to communication the client has had with other people in the company. Cons: I really don't have many complaints. One tiny nitpicky thing: the icon in my tool bar continues to bounce even after someone else has answered a call. It can get confusing. Overall: Close has been great and their customer support is really awesome.